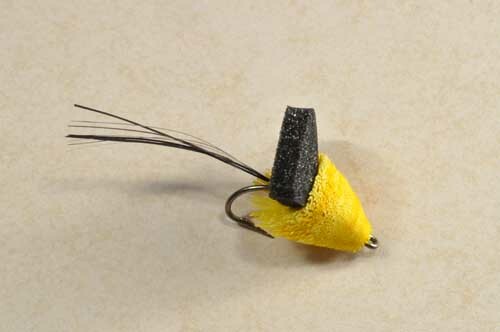 In this article (part two), Bass-Bluegill Lap Flies, Skip lists the flies and their patterns that mimic the size of the creatures sought by both bass and bluegill. Now you can double your chances of catching these fish by targeting both. In the previous article, The Bass-Bluegill Lap (part one of this two-part article), Skip tells you how to identify the insects and creatures targeted by both bass and bluegill. Understanding their common predatory instincts will help you pick flies that demand strikes from both of these wily gamefish. Hook: Heavy wire, short shank (bass-bug hook) a total hook-length of about 7/8 of an inch (2 cm). Jack uses a Mustad 3366, size 6. Thread: Black 6/0 for the tail and snag guard; black 3/0 for flaring hair (I prefer size-A rod thread for flaring the hair). Snag Guard: The Ellis-style pan-fish snag guard. Mason or Maxima monofilament of 0.012-inch diameter. (This is explained in Skip's book, "The Art of Tying the Bass Fly" in the chapter, "The Fathead Diver".) A snag-guard is optional. Tail: Two cree or grizzly hackle tips, splayed, two hook-shanks in length; inside the hackles, brown marabou, 1 1/2 shanks in length, over a shank-long tuft of fox squirrel tail. Skirt: Stacked olive deer-hair tips. 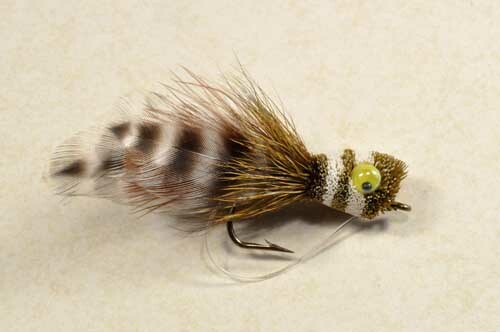 Body: Alternating bands of dyed-olive and natural-pale deer hair, shaped as a normal bass bug. Eyes: Hollow plastic eyes with free pupils. Comments: The most significant characteristic of the Fence Rider is its size—small enough to hook a big bluegill but large enough to interest a largemouth bass. Hook: Light to standard wire. 1X long (dry-fly hook)or a 1X long heavy wire hook, sizes 14 to 8. Thread: Orange flat waxed nylon (or whatever color you wish). Body: Bright orange dubbing, natural or synthetic. Eyes: Gold bead-chain eyes, or lead or lead-substitute barbell eyes. Wing: Orange marabou over yellow (or whatever colors you wish). Hook: Light to heavy wire, standard length or 1X long, a total hook-length of about 7/8 inch. Thread: For the tail and collar: 3/0 in a color to blend with the tail. For the body: a heavy hair-spinning thread in a color to blend with the body color. 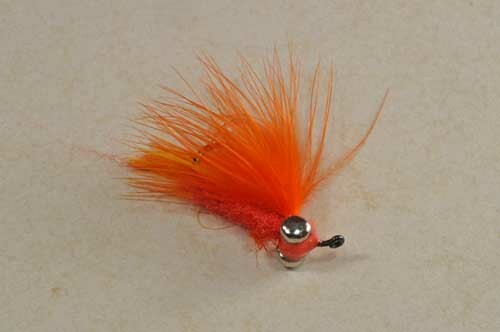 Tail: Two soft hen-saddle hackles or marabou or a few strands of flashabou. Collar and Collar Support: soft, buoyant closed-cell-foam sheeting cut into a large triangle(the collar)and a small triangle(the collar support). Body: Deer, elk, or antelope hair. Hook: Heavy wire, 3X or 4X long, sizes 10 to 2. Eyes: Lead or lead-substitute barbell eyes. Belly: White buck tail (other versions use other colors and even synthetic strands). Under Wing: Gold Krystal Flash or Flashabou (or some other bright synthetic strands). Wing: Brown buck tail (other versions use other dark colors and even synthetic strands).